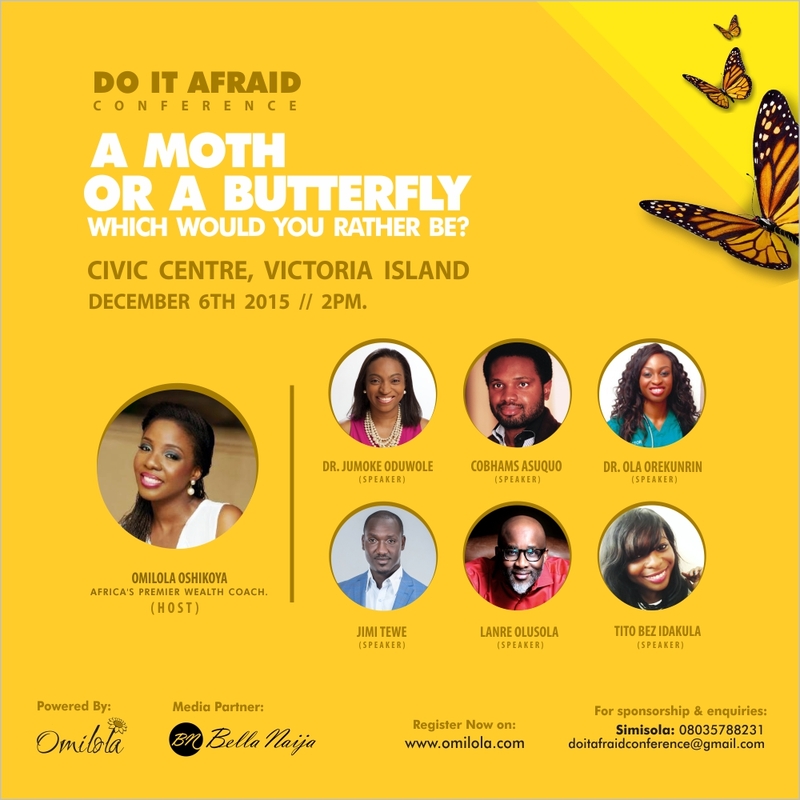 Omilola Oshikoya International presents its first conference based on the mantra “Do It Afraid”. “Do It Afraid” is a movement, aimed at inspiring this generation to fulfill their dreams, visions and purposes by overcoming fear. 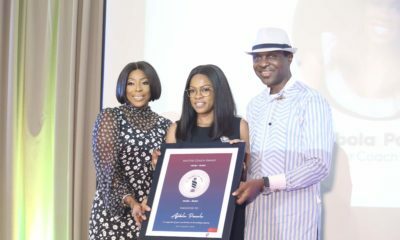 In April 2014, Omilola was invited to speak at an event and the topic she was led to speak on was “Do It Afraid’ based on her personal experience when she resigned from her job as an investment banker. She wanted to inspire the audience to conquer fear and fulfill their dreams and purpose in life, essentially to be all that they were created to be. What she didn’t realize was that this was the beginning of a movement. The turnout and feedback from the event was unprecedented and shereceived a lot of testimonies from the people who attended the event. 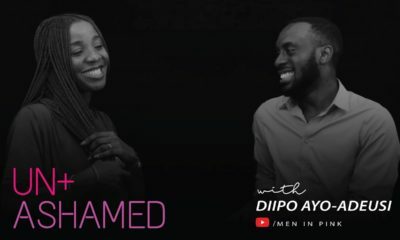 Shortly after she wrote an article on the same topic which was featured in BellaNaija and the feedback was also phenomenal. She went on to produce an audio cd as a result. What started as a random topic of discussion at an event, has gone on to become a tag line synonymous with many people. A lot of people are living in fear and this is affecting different areas of their lives especially their career. They are paralysed by fear which comes in different types. This conference could not have come at a better time. Currently, a lot of companies in different industries such as the Oil & Gas industry, Banking, Telecoms etc are laying of staff and will continue to do so in order to survive the current economic terrain. A lot of people will find themselves out of a job and this would worsen the unemployment rate with a current low ratio of employment to population at 29% compared with Indonesia at 45% and Brazil and Russia at 49% and 51% respectively (McKinsey & Company Report 2014). Furthermore, companies most especially within the banking sector would move their back office staff to marketing functions. There are a lot of people who are afraid to step out on their own. There are a lot of people who have business ideas and dreams they would like to fulfill however they are afraid. Furthermore, a lot of people are stuck in jobs that they do not like due to poor working conditions. Asides from this, there are also people who face fear in other aspects of their lives. There are some who are in abusive relationships but are too afraid to leave. There are some people who are afraid to stand up to their parents and withstand the pressure of marrying the wrong person. The “Do it Afraid” conference, aims to inspire the people that fall into these categories, to conquer fear and fulfill their dreams or passion. The conference will feature a panel discussion where panelists will share their experiences and provide tips to encourage the attendees to “Do it Afraid”. See a description of the session below. This session would be facilitated by a moderator, Bolatito Bez Idakula (Founder My Lighthouse and Radio Anchor). The speakers include Cobhams Asuquo (Award winning Music Producer, Singer & Writer), Dr. Jumoke Oduwole (Lecturer Department of Jurisprudence & International Law at University of Lagos), Jimi Tewe (Career Coach, Author & Speaker), and Dr. Ola Orekunrin (CEO of Flying Doctors of Nigeria). Africa’s premier Life Coach Lanre Olusola, would also be speaking on “The Psychology of Fear and How to Overcome It.” This would be a practical session. 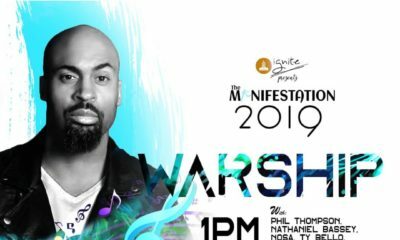 He would also be giving out free coaching sessions worth N500,000. Africa’s premier life coach? Africa’s premier wealth coach? Y’all realise that Africa is a continent with 54 countries right? And NIGERIA is not a benchmark to define AFRICA. You people should just stop.